I cannot believe Christmas is here already! 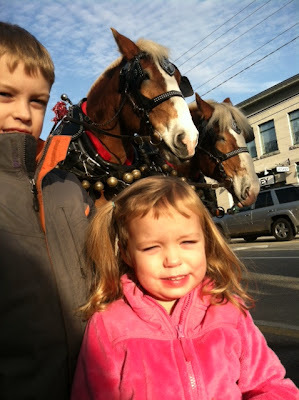 I've really enjoy the past few weeks with the kids and doing some Christmas activities in our area. 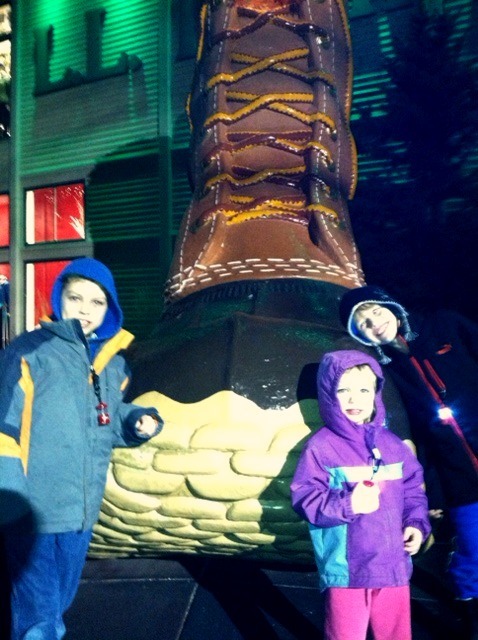 LL Bean has been the major source of our holiday fun. This store really puts on quite a holiday event. They started with the events in mid-Novemer and are still going strong. I've taken the kids down several times to different events. Ben and Bill, two beautiful horses, and their owners are one of the main shows at LL Bean. 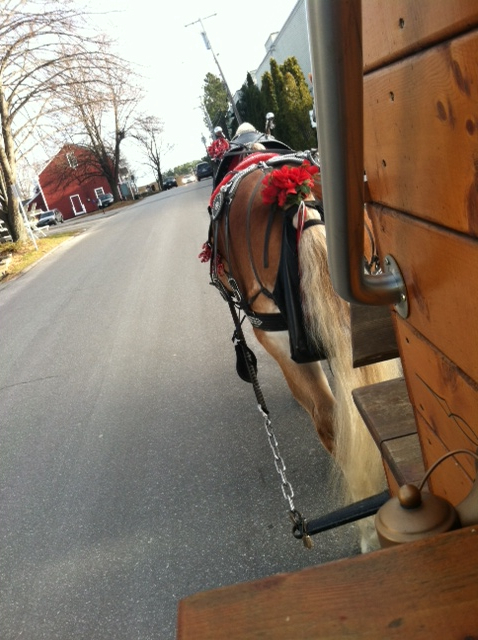 They are offering carriage rides around Freeport. It's just a quick little ride around the block but it's still quite a bit of fun! Izzy is still in love with them. When we went down to LL Bean yesterday, we say Ben and Bill heading off for another carriage ride and she shouted out "hi Ben and Bill! I love you!" I wasn't sure this one was going to happen. 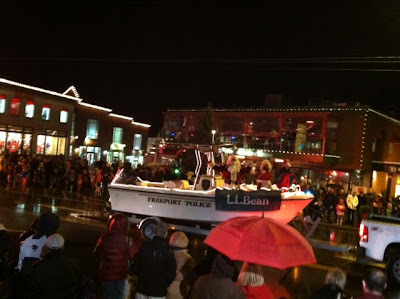 It was a very dreary, rainy night, but the parade was still going to happen and the kids didn't seem to care. They needed to see Santa come to town! I really LOVE that Santa comes to town in a boat! Definitely a coastal town thing. 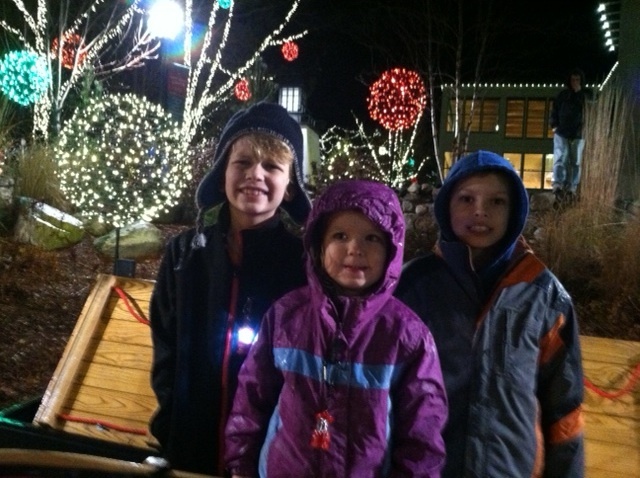 And the outdoor lighting at LL Bean is simply gorgeous. Now today is a nice and relaxed day. I got to go for a 4 mile run this morning with Ward and the brother-in-law, Wade, and I've spent the day making some cookies, pumpkin pie and cuddling with the kids. Our Christmas festivities will kick shortly with our dinner for Ward's side of the family tonight. Then tomorrow morning, we'll have Christmas here with the kids. Then we'll head off to my dad's house later on. I wish you all a very Merry Christmas! Take this time to enjoy the family. I got up for a one hour spin, hung out with some family (bro-in-law home from Navy w/ wife), and will go over for dinner with husband's family tonight. Hosting them tomorrow. Have a Merry Christmas! Merry Christmas to you and your family! We went for a 4 mile run with my mom today, it was nice! I love that Izzy loves Ben and Bill, that's so cute! It looks like so much fun! How great that LL Bean does so many things. Have a wonderful Christmas my beautiful friend! You guys have quite a treat with LL Bean being right there. It reminds me of many fond memories during the week I spent in Maine a decade ago.